Skylights are a great way to bring natural light into a room without windows. Skylights offer a good way to bring natural sunlight into a room where standard windows would be impossible or impractical—interior rooms or attic spaces with sloped ceilings and high knee walls. Venting skylights can also provide air circulation and allow rising warm air to escape, thus reducing your need for cooling. Adding skylights can transform a room, but before you start cutting holes in your roof, you have some things to consider and some choices to make. Skylights are available in a variety of configurations and features from a great many manufacturers. The one you ultimately select will depend in part upon the physical constraints of your setting, in part on your budget, and in part on purely aesthetic considerations. These skylights not only vent—they are motorized and solar powered, with built-in blinds that can be lowered remotely. There are three basic types of skylight—fixed skylights, venting skylights, and tubular skylights. The names given these three types vary somewhat from manufacturer to manufacturer but the fundamental differences remain the same. A fourth variety, roof windows, are a type of venting skylight used where circumstances make it practical. Fixed skylights, as the name implies, are ones that do not open. Generally rectangular or square, they are glazed with flat or gently curved panes of tempered glass, or with acrylic or polycarbonate plastic in flat, bubble-shaped, or other molded profiles. Plastic skylights are usually more economical than glass ones and put less weight on your roof, but plastic can scratch and dull over time, and plastic-glazed skylights afford fewer options with regard to energy efficiency and UV (ultraviolet) protection. Glass skylights come equipped, at a minimum, with tempered glass in a double layer with an air space between them. 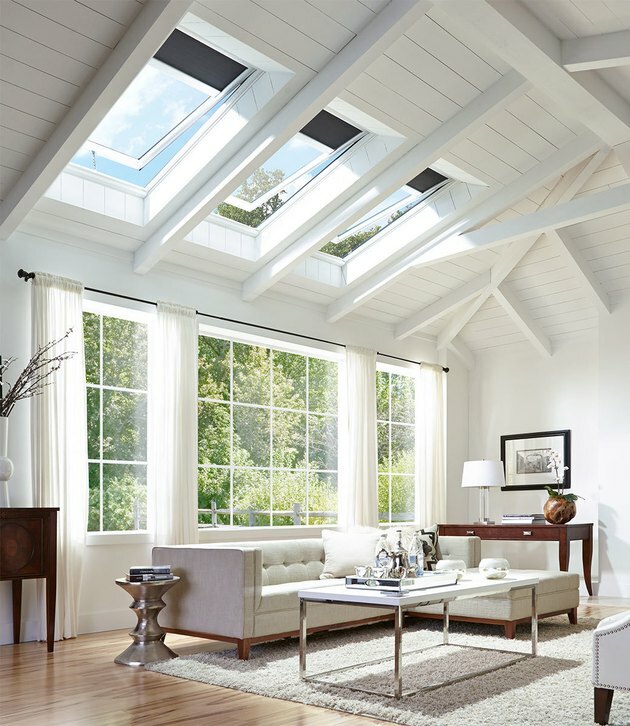 Better glass skylights will include a low-E (low-emissivity) coating that modifies heat gain and provides protection from ultraviolet rays for furniture and floors. The best glass skylights are filled with argon gas between the panes to improve their insulating ability—their R-value—even more. Venting skylights are designed to open by a limited amount using either a hand crank or a small motor. Like fixed skylight, they may be glazed with either plastic or glass. Venting skylights can help mitigate heat gain, especially during the summer months and in sunny climates by allowing accumulated heat to escape as it rises. Venting models are naturally more expensive than fixed ones and are best used in spaces such as an attic room, where the operating crank will be within reach. In taller, less accessible circumstances, manual venting skylights can be opened using a crank on an extension pole. Motorized venting skylights, controlled with a wall switch or wirelessly with a remote control are also an option. Fully automated models come equipped with rain sensors that close them as the first droplets fall. Roof windows are a type of venting skylight that opens completely. Roof windows, as noted, are a kind of venting skylight, typically used where the roof slope is more nearly vertical and the roof window can be placed within easy reach. 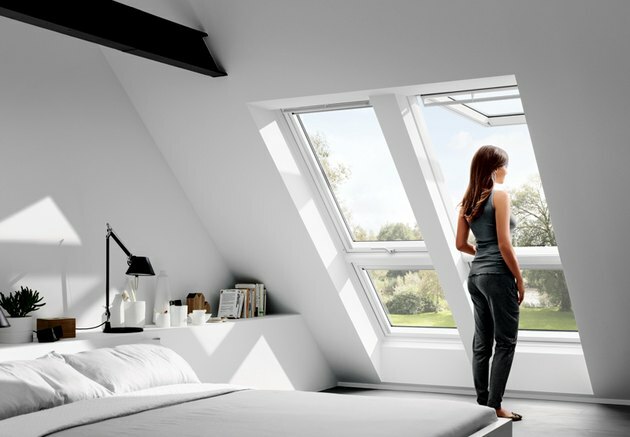 Unlike venting skylights, which pivot from one end and move only a limited amount, roof windows open more fully, some pivoting in the middle to make it possible to rotate the pane for easy cleaning. Some roof windows even qualify as egress openings if they are large enough. 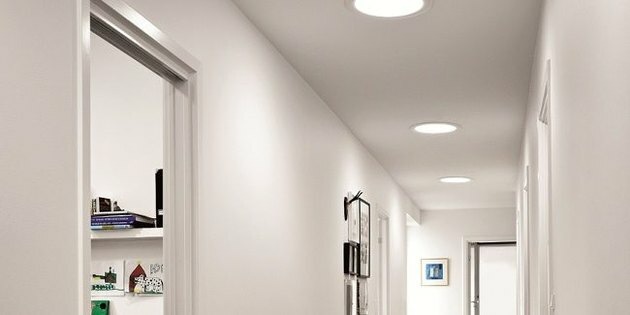 Tubular skylights light up a windowless hallway. Tubular skylights are the least expensive and most DIY-friendly means of bringing natural light into a room. They consist of a sealed, domed round "window" attached to the roof and a mirror-finished rigid or flexible tube that transmits sunlight down to a diffusing lens affixed to the ceiling of the room you wish to illuminate. Standard diameters for tubular skylights are 10 inches, 14 inches, and 21 inches—sizes that allow the skylights to easily fit between roof rafters or trusses. The polished tubes that carry sunlight into the room can be extended to reach through any attic space to the ceiling of a room below. 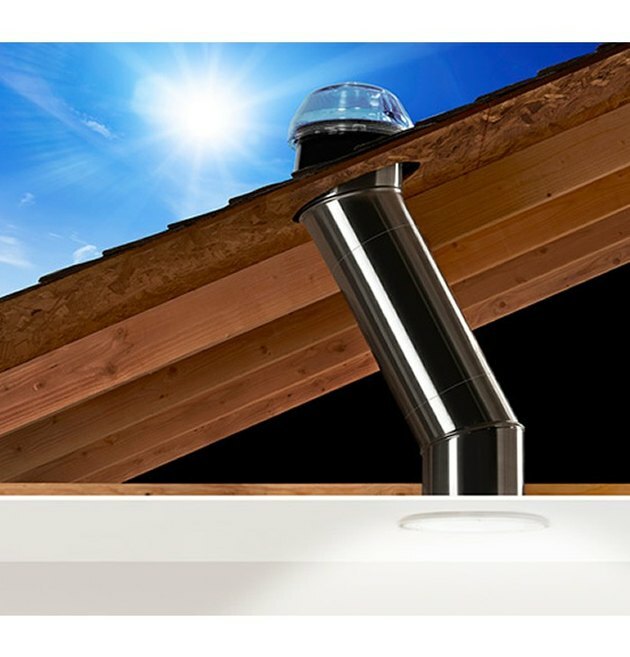 Flexible light tubes can be bent and the rigid ones angled to fit around obstructions between the roof and the ceiling below, although careful positioning of the skylight will keep obstructions to a minimum. The straighter your light tube, the more light it will deliver. 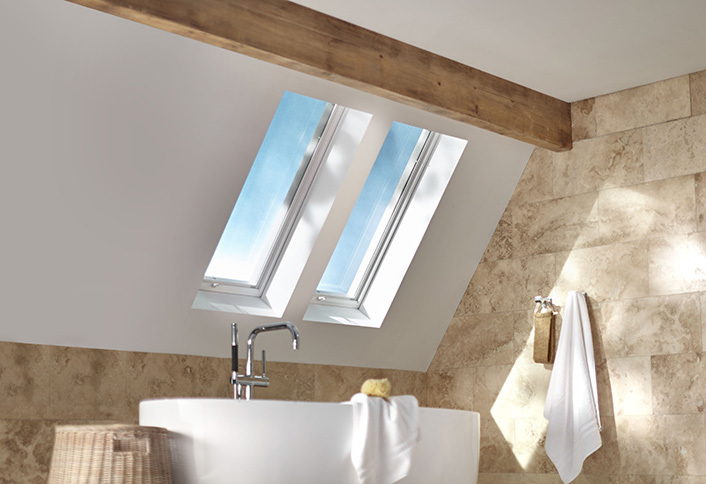 A limitation of a tubular skylight, as with any skylight, is that it only delivers light in the daytime. To compensate for this, some tubular skylights have built-in electric light arrays that take over as night begins to fall. Some models even dynamically balance artificial light with the fading sunlight, providing a smooth transition from day to night. Information guides will tell you that south- and west-facing skylights will be most exposed to direct sunlight and heat gain and that skylights facing the north or east may not bring in any direct sunlight at all. All things being equal, that would be useful advice in planning the location of your skylight. In reality, however, the orientation of the slope of your roof is not something you can change and despite the shape of the roof, you will still want the skylight to be positioned where you need it most. The best use you can make of such information is to factor it in when choosing clear vs. tinted glass, vented vs. non-vented skylights, and whether to equip your skylights with blinds. To make the transition between the rooftop skylight and the ceiling of a room beneath the attic, a chase must be built. The size of skylight you are able to choose will be determined in part by the construction of your home. If rafters support your roof, removing a portion of one (after properly reinforcing it and adding in headers) to accommodate a larger skylight is fairly straightforward. But if it is trusses, typically spaced 24 inches apart, that support your roof, a two-foot wide skylight (actually 22 ½ inches wide) may be your limit. Cutting into trusses requires the services of a structural engineer to design an alternative structure—an extra expense that may make it cost-prohibitive. Unless your skylight opens directly onto the sloped ceiling of an attic room, it will require a chase. A chase is the rectangular passage between the skylight on the roof and the horizontal ceiling of the room below. It's framed out in the attic and then finished with wallboard or paneling. Chases take one of three shapes: straight—perpendicular to the ceiling below, with all four sides parallel, angled—perpendicular to the slope of the roof, all sides parallel, or flared—with one side perpendicular to the ceiling, the opposite side perpendicular to the roof slope. One thing to remember before you cut that hole in your roof (or allow a professional to do it) is that skylights have a limited lifespan. Even the best ones are warranted for only ten years. A rule of thumb is to expect to replace your skylights at the same time as you replace a shingled roof. Standard flashing for most skylights assumes an asphalt-shingled roof, through flashing kits for tile or metal roofing are also available. Removing the skylights in order to re-shingle often warps them and damages their already weathered seals. Frequently, if the old skylights are remounted and flashed after re-roofing, they leak. For that reason, many reputable roofers require a disclaimer from the homeowner before they will reinstall old skylights on a new roof. That's also the reason why you wouldn't want to put a new skylight onto a roof that isn't fairly new. Tubular skylights employ a mirrored tube to convey natural light from your roof to your living space. Installing a quality skylight and doing it properly and safely may be beyond the abilities of the average do-it-yourselfer. Doing so requires tools and experience in both roofing and carpentry and the downside consequences of a mishap are great. Tubular skylights, on the other hand, require only basic tools and skills. The reflector tube requires a hole in the roof that need not disrupt the rafters, and the rooftop unit is easily flashed. Inside the attic, the tube provides its own structure and can be angled around obstacles. The tube passes down through an opening cut into the ceiling of the room below and is finished with a diffusing lens and surrounding bezel. 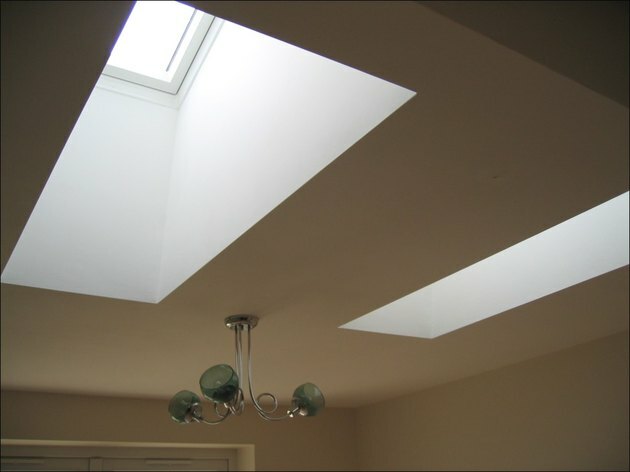 The specifics of skylight installation will vary with the manufacturer and the type. Specific installation videos for many models are available online. Even if you plan to employ a contractor to install your skylight, it's worthwhile to preview the process. You'll be prepared to ask better questions and to know what to expect.